A materials list will be emailed to you once payment received. You can have fun with this pattern and use any number of seed beads in each square. 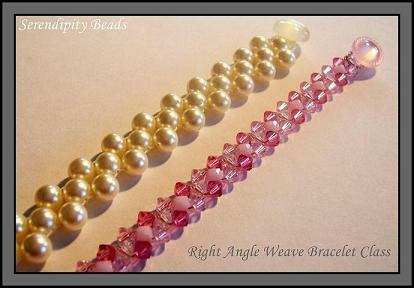 You can also play around with the larger bead used changing to a size 8 seed bead or a 3m crystal. Play with colours too to change the effect. A great introduction to learning bead embroidery. Attatching cabochon (flat backed bead with no holes) to bead backing, Forming a bezel around the stone. Creating the bead embroidery, attaching work to ultra suede backing and finishing. This is a class that is for two sessions on different days)You will be hooked and great relaxation. A great beginners class as works up very quickly and you can play around making it with just seed beads or a mixture of crystals, pearls and seed beads depending on your budget and skill level. Can be adapted into a bracelet or a necklace and adding other beads can change the look completely. Rivolis are one of Swarovski's most gorgeous crystal beads. With their pointed back and no hole it can be a bit tricky to figure out the best way to encase it in beads in order to link to more materials. 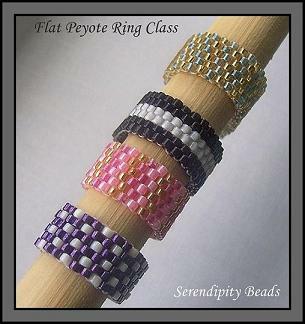 This class will teach you step by step in person the simplest way to bezel a Rivoli stone using Tubular Peyote Stitch. 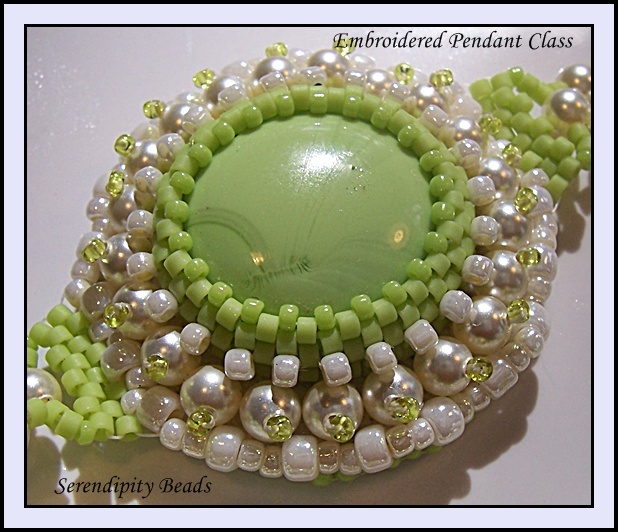 Learn how to do this and you can make all sorts of creations and team it up with a rope made from one of the other classes on offer here at Serendipity Beads. A great version of Tubular Peyote using different size seed beads to create a ruffle effect. You can go really chunky or not so big with this stitch and it is loads of fun. If you are learning it is easier to learn Tubular Peyote first and then move on to this one and making your first bracelet in a similar colour scheme first is a little easier. But of course if you wish to go all out on colour - please do! In saying this if you wish to give it a go no experience is necessary. 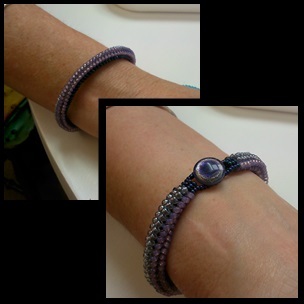 This is a relatively easy and quick bracelet to make up. Great for a 2nd or 3rd poject for beginners once you have tried the basic Peyote ring. Chenille stitch also offers you a chance to learn a little bit of Herringbone (Ndeble) stitch. Uses size 8 or size 11 seed beads and colour ideas are endless. Once you have mastered this experiment with different size beads throughout. (Sample photo shows size 8 beads or size 11 beaded bracelets. An expansion of Flat Peyote stitched rings instead of zipping up the ring can turn it in to a braclet and can actually be as wide as you like. A materials list will be sent out once booking and payment received. A fun way to be introduced to the world of Peyote (pay-oh-tee) stitching. This is an even count flat Peyote stitched ring which depending on colours used and where each different coloured bead is placed can create a plethora of patterns and designs. You will be taught the stitch and how to zip up the ends to form a ring where you cannot see the join. Depending on size and width of your desired ring you may have time to make a few. Class will take approximately 1.5 - 2hrs depending on number in class. Another stitch to add to your repertoire and can be used in so many ways. Works up relatively fast especially if using larger beads, as two beads are picked up in each stitch. In the class you will be learning with size 8 seed beads but all manner of sizes and shapes can be used for this. Similar to twisted herringbone but this is actually the precurser so gives an altogether different look.